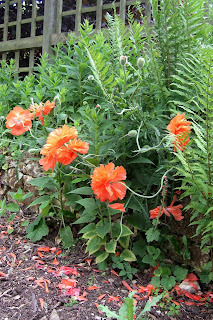 Poppy stems are sturdy enough to easily support their blossoming heads. And yet they curve and curl, twist and bend in a slightly chaotic manner that has little to do with following the sunlight. Perhaps the poppies wish they were vines, able to grasp and twine. Poppies' erratic curves are one of the qualities that made them a flower much admired, drawn and used as inspiration by the designers from the art nouveau period. The common garden poppy cannot completely escape the whiff of danger that belongs to its cousin, the heroin poppy. All poppies have come to symbolize sleep, death and decadence. That's more than enough to inspire any artist. Last week's posting was about bright, clashing colors. This week is about subtlety. The cabbage plants at the garden center took me by surprise. I think of cabbage leaves as being green with a silvery sheen. What a surprise to discover a carpet-sized spread of plants whose leaves were splashed with tints of yellow, pink and lavender. Green may not be simply green when you stop to look more carefully. How far can green be "pushed" with the addition of other colors and yet still be considered green? This is an artist's question, one that can be a mystery, a goal and a mainstay in the ways we use color in our art. 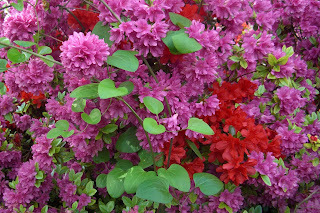 The trio of azaleas came with the house. 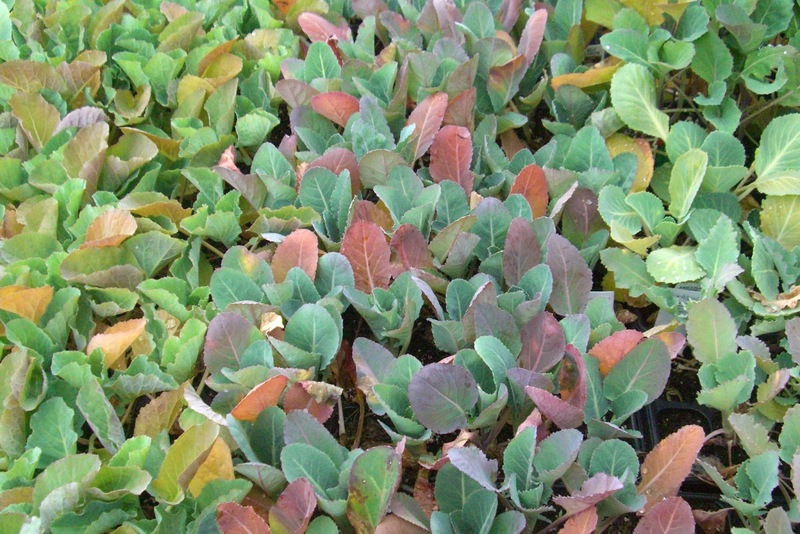 They grow in a bed that looks as if it was planted in the dark by a color blind person. 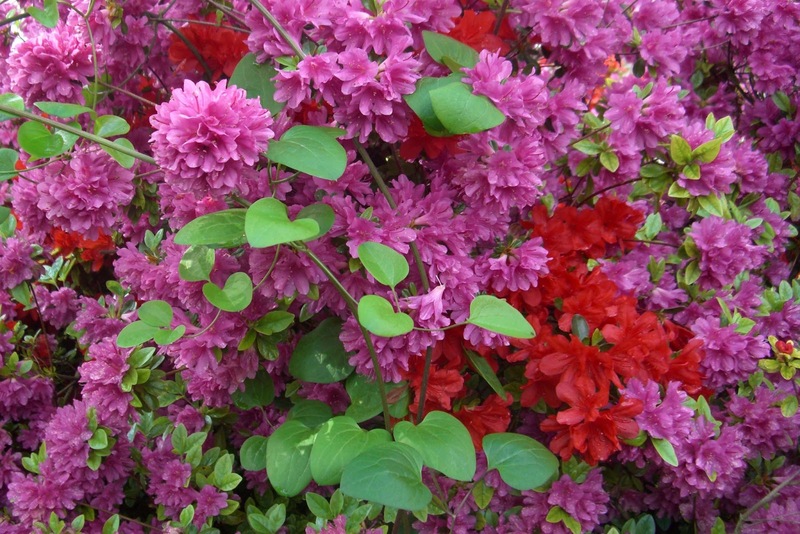 The orange-red azalea reminds me of acrylic yarn from the 1970s. It merges with its magenta-pink neighbor into an unfortunate stomach-churning palette. The third azalea, plain white, looks out of place and slightly embarrassed. Color combinations go in and out of fashion. In the 1960s pink and orange looked shocking at first, then quickly came to represent youth and energy. The disco era brought florescent colors. Now people think nothing of wearing turquoise with orange or purple with chartreuse. Those azaleas will always irritate me, but they are so healthy. My plan this year is to encourage those bright green weeds. Baseball fans like to show their allegiance to a team. They wear hats with team logos and shirts emblazoned with the names of their favorite players. This little girl toddled around the concourse in an outfit that might have been a collaboration between her mother and her father. Or perhaps it was chosen by her five year old sister. 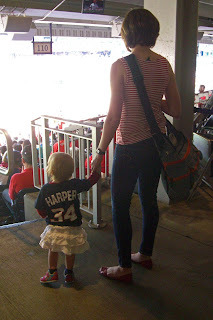 Surely Bryce Harper would be pleased to know that he has such a fashionista among his fans.